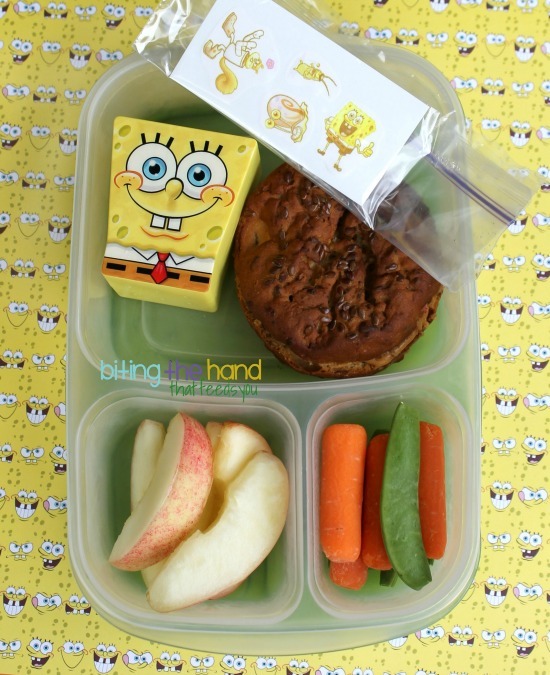 Biting The Hand That Feeds You: SpongeBob StickerPants! 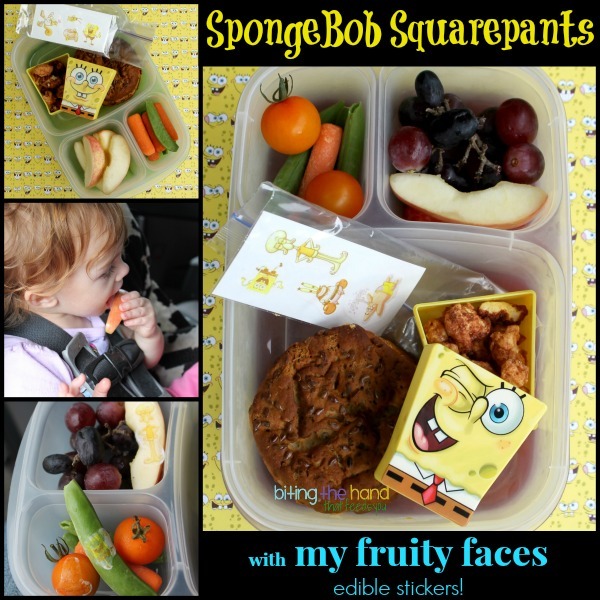 Monday, 9/16/13 - I've been wanting to use the Spongebob My Fruity Faces edible stickers we got free to review with the Playful Pets and Dora ones, but was too lazy to hand-paint another Spongbob. I finally copped out and just used some licensed accessories. I packed a few Cosmos Creations Cinnamon Crunch puffs in the Spongebob treat box from Easter, since I wasn't sure if they were air-tight enough to keep the edible stickers from dissolving before lunch. I played it safe and just put the "stickers" in a zip-close snack-size baggie. Little E and I ate in the car after dropping Big Sis off at school, so I applied the stickers for her. Yes, I licked the ones that went on the sugar snap pea and tomato. I figure I have to eat plenty of drool-covered items she shoves in my face, she can handle a few of my licks! E was enchanted with the stickers on her food. They taste a bit sweet, so she started licking them off. 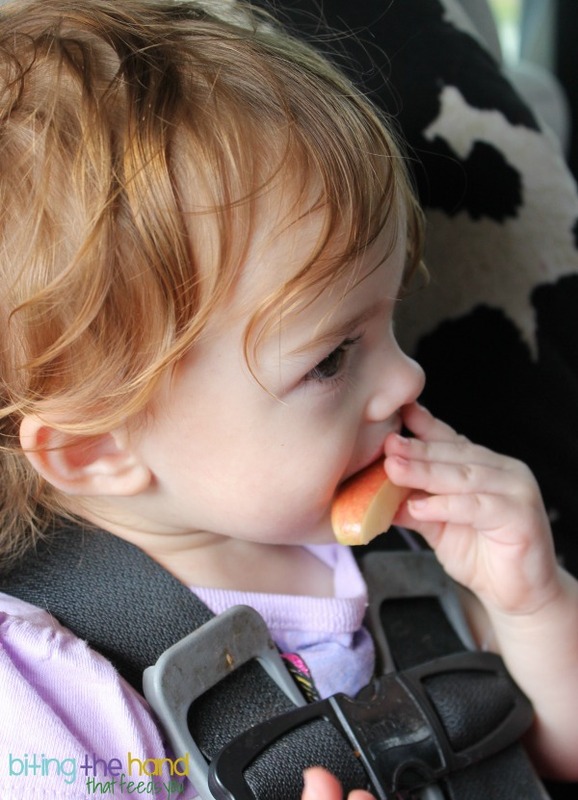 But she ate *all* her fruits and veggies before nap! 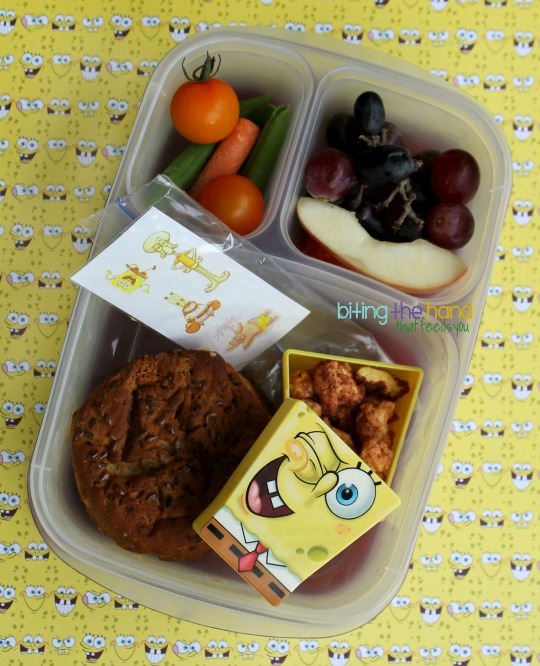 Aww....so lovely & sweet bento! It's interesting to know the stickers actually is edible!! Hmm...got to check out the link ^_^ Thanks for sharing! Very cute stickers! I hope that someday they offer specific packs. My girls would probably really likes the playfull pets and the Spongebob, but I could never sell Dora here. We OD'd when my youngest was little.